This large stone cross, carved with symbols of Jesus’ Passion, was used to evangelize Nahuas after the Spanish conquest. This cross takes the shape of two rounded cylinders of stone. 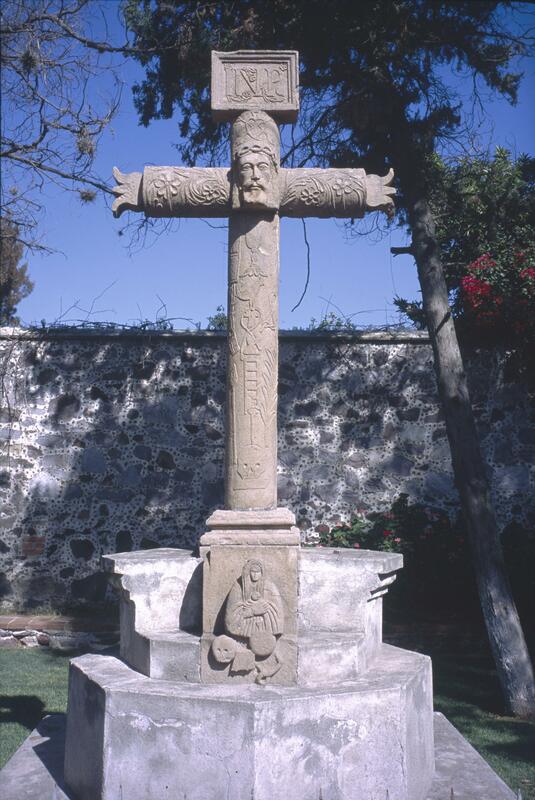 In the mid-16th century, the cross was set in the center of the church courtyard of Acolman, an Augustinian monastery in the Valley of Mexico and it still stands there today. The pictures and symbols that cover the cross, carved in low relief, represent items that figure in the passion narrative of Jesus’ crucifixion—the rooster, the ladder, the lance and the palm branch. The image of Jesus’ face is seen at the crossing and frequently appears on atrium, or atrio, crosses in Mexico. The arms of the cross are covered with swirling floral motifs, which refer to the idea that the cross of the crucifix, by bringing redemption to mankind, is also the verdant Tree of Life. Such imagery may have resonated for indigenous viewers who had their own tradition of a world tree, or axis mundi. At the bottom of the cross, the mourning Mary appears in scenes of the Calvary. Next to her is the skull of Adam, whose grave was believed to be at Golgotha, where the Crucifixion took place. It is also carved in shallow relief on the bottom of the cross itself. 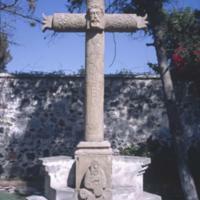 It is likely that an indigenous sculptor working for the Augustinian friars of Acolman carved this cross. This church was one of the centers for native evangelization and this atrio cross was carefully aligned with a larger project of conversion. This body of this cross, as were many atrio crosses of the 16th century, was carved of stone. The images along the body of the cross were carved in low-relief. In contrast, Christ’s face and Mary, at the bottom of the cross, were carved in high-relief. While most crosses used in Catholic ritual showed the dead body of Christ, this one displays the instruments of the Passion. Other atrio crosses in Mexico share the same imagery. Since Passion crosses have also been found in Europe, they might have originated there, traveled across the Atlantic in the form of printed images, and then reinterpreted by indigenous carvers in the New World.